Seoul, South Korea (CNN) About 100 wooden transport cases are being sent to the Demilitarized Zone, starting Saturday, to prepare for receiving US troop remains from North Korea, a representative for US Forces Korea said. 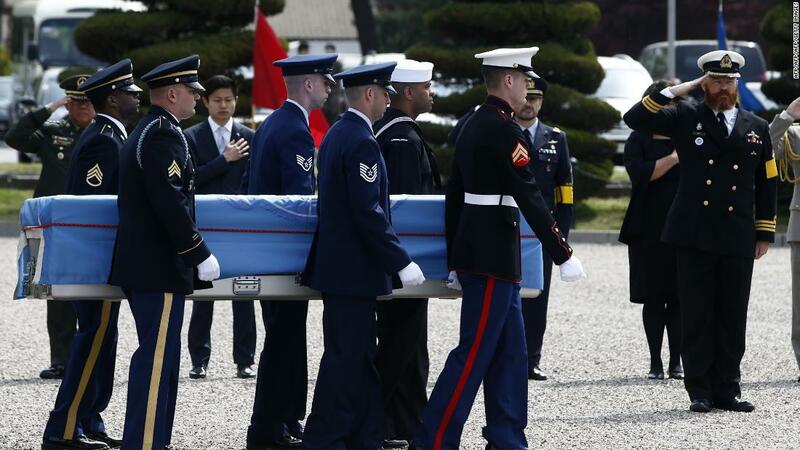 The Trump administration is expecting North Korea to return up to 200 sets of remains believed to be US service members who died during the Korean War, four administration officials said earlier this week. The transfer date and location have not been finalized, the officials said, but they said the administration is ready to receive the remains if the North Koreans decide to move quickly. The US says some of the remains could be those of service members of allies. Nationalities will be determined when the remains are tested in the US. The transport cases are headed to the DMZ’s Joint Security Area — the border village of Panmunjom — “for the repatriation of the remains,” said Sung Ho-jung, an information officer for US Forces Korea. President Donald Trump has pointed to North Korea’s agreement to return the remains as one of the successes of his June 12 summit with North Korean leader Kim Jong Un in Singapore. As many as 5,300 sets of US service member remains are still somewhere in North Korea, the US Defense Department has said. CNN’s Barbara Starr and Jay Croft contributed to this report.